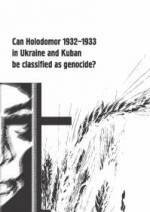 Can Holodomor 1932–1933 in Ukraine and Kuban be classified as genocide? Second edition / CO «Kharkiv Human Rights protection group»; cover by B. Zakharov. — Kharkiv: LLC «human rights publisher», 2015. — 52 p.